For Waikato Expressway’s Rangiriri Section Project, the New Zealand Transport Agency and stakeholders sought to deliver social, environmental and cultural outcomes through a design and mitigation strategy for the realignment of State Highway 1. The existing alignment of the highway cut through the Rangiriri Pā site of the 1863 Battle of Rangiriri, a significant event in the context of the NZ Land Wars. The Rangiriri project sought to reveal the Pa in a symbolic way; along with associated landscape features, including the historic 1863 trench and associated wetland. Our landscape architects worked with Waikato Tainui, Heritage New Zealand and cultural advisors to create a design that was in line with the International Conference on Monuments and Sites (ICOMOS) charter, and fully reflects the relationship between tangata whenua and the site. Rangiriri is regarded as Wāhi tupuna (ancestral site). The landscape restoration and overall design focused on three key Kaupapa (themes): Nga korero o Nehera: telling the stories of the Wāhi Taonga (treasured site); Te Mauri o te Whenua: the health of the environment; and Te Mauri o Te Wai: the health of the water. A decision was made to reinstate a large wetland in recognition of the natural character of the area at the time of the battle, in addition to providing for stormwater treatment and management. The flood plain context was a key part of revealing the story of the Rangiriri Pā and its strategic location. 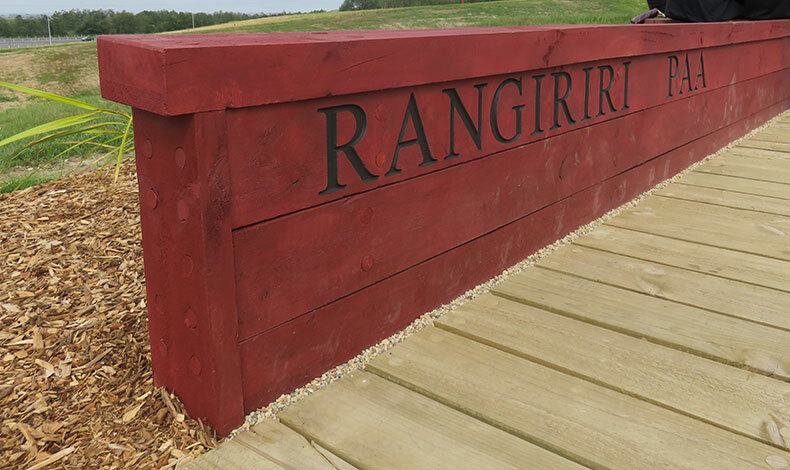 The memorial reinterprets the footprint of the original pā trenches and lines those trenches with retaining walls using timbers carved by a Maori artisan to reflect part of the symbolism of the pā and the Kiingitanga movement. Tewhaatewha, a traditional chiefly weapon, have been used to indicate the scale of the original walls. These are positioned along the top of the retaining walls and rise to the height of the 1863 trench, providing a visual cue to the historic landscape. Rendered in totara wood and steel, with brass accents, these elements also represent the muskets used in the battle. Six pou are positioned along the reinstated trench. Through traditional carving, these represent aspects of the battle, the role women and youth played in it, and the imprisonment of warriors afterwards. By sensitively revealing and reinterpreting the site, restoring the wetlands and planting flax for cultivation, Kaitiakitanga (guardianship and conservation) has been restored to the people, the land and tīpuna atua (ancestral guardians/spiritual creatures) therefore restoring the mana (life force) and ora (health) of this Wāhi tupuna (ancestral site) for Waikato-Tainui. In achieving this project, Boffa Miskell utilised a mix of expertise and experience. This included landscape assessment and interpretation; consultation with Waikato-Tainui and other stakeholders; development of a mitigation package; preparation of consent assessments and presentations at hearings; landscape design, contract management, and implementation review.